The Raptor Center: Osprey . . . Did You Know? 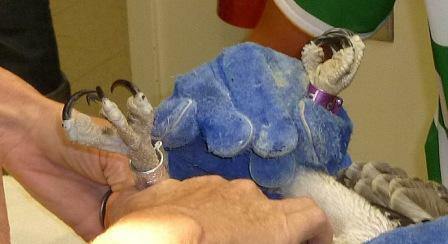 The Raptor Center loves osprey, so we wanted to feature them in another posting. 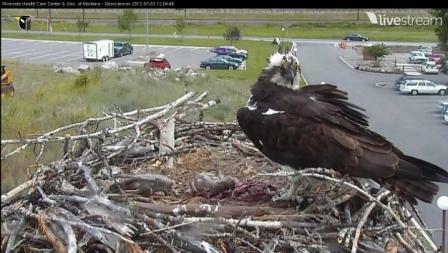 Do you remember the osprey cam we posted? 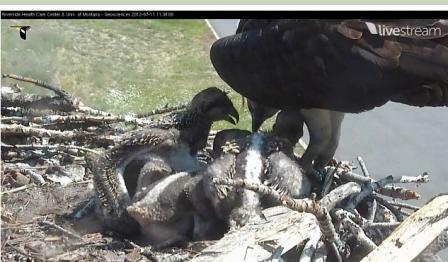 We wanted to show just how quickly osprey (like all raptor chicks) grow. The first two pictures were screenshots taken on July 2. The next two shots were taken yesterday; just nine days later! 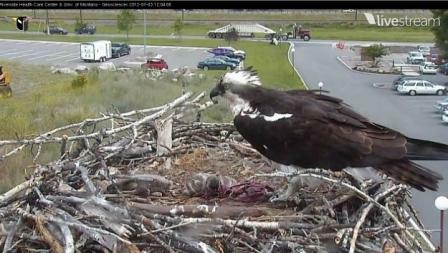 We would like to share some interesting facts about osprey. In North America, migration typically begins in August, although individuals (generally failed breeders) may leave earlier and wander widely before beginning true migration. Breeding pairs did not migrate or winter together. Median fall departure dates for satellite-tracked females preceded males in the East and Midwest; no comparisons could be made in the West. Among mated pairs, tagged females departed 7–39 d before their mates in all cases. Mean distance traveled per day by satellite-tracked individuals during fall migration varied from 95 to 380 km/d. One of the most impressive trips was made in early September 2008 by a three-month-old female osprey named Penelope, who traveled frm Martha’s Vineyard, Massachusetts, and flew 2,700 miles to French Guiana in 13 days. Band returns and sightings of nonbreeders on wintering areas indicate first-year birds generally remain on wintering grounds 18 months, or until they are in their third year. Rarely, 2-yr-olds return to breeding grounds. 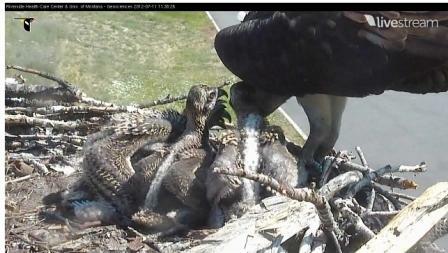 We know much of this information from bands placed on the osprey chicks' legs (the last two photos, posted yesterday, are cropped to show the silver federal band and colored project band), as well as satellite tracking "backpacks" on individuals. The information for this post came from the Cornell Birds of North America Online website, as well as a paper co-authored by Mark Martell (The Condor, 2001) of Audubon Minnesota, and formerly of The Raptor Center. As always, we thank our friends like you for continuing to support our work.